Bernie's got 49.6%, Hilary's got 49.8%, 90% of the precincts are reporting, DOES BERNIE STILL HAVE A CHANCE? I seek to answer the question of what is the probability of a candidate winning an election (or caucus) when not all the votes are in. Now I will not take in any other information than votes collected for each candidate and percent of votes collected so far. I will talk about my first approach and then talk about where I went from there and then finally what someone who really knows what they are doing might do when trying to answer this question. For anyone who was watching the Iowa Caucus on February 1, 2016 (to which the title refers to), you probably know that some of the most crucial information to answering the question of does Bernie have a chance is what percent of the votes have been reported from all the different counties. On CNN, they would show an overall percent of precincts that have reported but they'd also show the percent that have reported from all the different counties - some of which might be more pro-Bernie than average or more pro-Hillary than average, etc. One of the most fun parts of watching the debate was speculating what the chances are at any given moment of each candidate winning. From this experience and wanting to practice and develop my stat-comp skills, I became interested in working on this problem. The programs that I wrote treat the whole state as one giant population. If you had realtime access to the information that CNN has, you could extend this technique to incorporate a sum of all the different counties, treating each one as a separate population of voters. This would certainly add accuracy. For now, to keep things simple, I will treat the whole state as the same population. Also, I will ignore the fact that in the Democratic Caucus, each candidate is awarded delegates according to how well they do at each voting site. Because I don't know the rules that govern this process, I'll ignore this fact. So yes, this is a theoretical exercise.. I will make the assumption that the votes will be counted randomly from a basket of votes. This seems reasonable - the votes will be thrown in a basket all together and be plucked out randomly. There are two sources of uncertainty in the problem. One is estimating the true proportion of the population of voters that plan to vote for each candidate. I've always been taught to approximate the distribution of this proportion using the normal distribution. If we say the true proportion of voters who plan to vote for a candidate is , the number of votes for a candidate is , and the total votes is , then, . I use for Gaussian distribution so as not to get confused with , the total number of votes seen so far. Now the trouble is the Xs are not independent of one another. In other words, the candidates are competing for votes. The Xs actually belong to a multinomial distribution. Given and , . The number of votes for each candidate has a negative correlation. If you were very astute in checking that code out, you'll notice that I made an important choice that I have not yet discussed. Within each election, I standardized the population proportions so that the sum will add to 1. I did this because it feels right - they are probabilities, they should add to one. Also the properties of this process seem to mirror the real life situation. If, according to random chance, we are underestimating one candidates population proportion, that means we should be taking away from the other candidates' proportions. This means that random variables that are the population proportions are negatively correlated as well. The simulation runs fairly quickly - 100,000 election simulations takes roughly 5 seconds. To get the probability of each candidate winning, all one must do is keep track of the number of times each candidate came out on top and divide by the total number of simulations. Probability of each candidate winning: Clinton - .99991, Sanders - .00009, O'malley - 0. So, under the naive assumption that the whole state is one population and that the votes are coming in randomly, even through Clinton is only 450 votes ahead with about 16,666 votes yet to be counted, she is virtually assured of victory. Let's say the same proportion of votes have come in but this time on 80,000 votes observed and 50% of the expected number of votes. Probability of each candidate winning: Clinton - .822, Sanders - .178, O'malley - 0. The results seemed strange to me. Of course these numbers do not currently properly model the real life scenerio on account of the fact - as I mentioned - that I am treating the entire state as one population. Still the simulation seemed to be overly bullish for the favorite. Here are some more runs of the simulation with some hypothetical scenarios. Maybe you'll agree with me, maybe you won't. Probability of each candidate winning: Candidate 1 - .64, Candidate 2 - .36. Probability of each candidate winning: Candidate 1 - .70, Candidate 2 - .30. Perhaps the numbers are where they "should be". 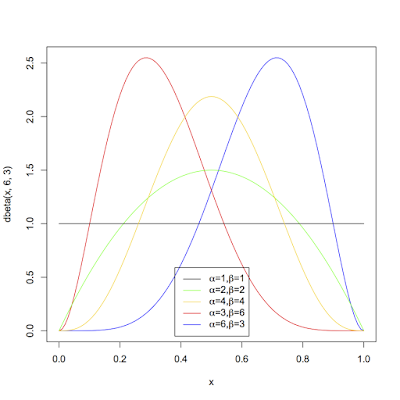 Still, I was unsatisfied and wanted a way of calculating the real distributions that the determine the probabilities. I didn't want to rely solely on simulations. So I tried my best to do it. Nonetheless, it was good practice. and then perform the triple integral to get the mean and variance of this cockamamy distribution. Instead of doing that, I just simulated these quantities. The great thing about random number generation is that the chances of the sum of these three random variables being exactly 0 is basically 0. Especially considering the the sum of the expectations of the random variables in the denominator for this problem will always be 1. I calculated all the v's and c's from simulation. In general all the v's were fairly similar to the variances of the normal distributions sampled from. All the c's were negative - except those on the diagonal of course - which makes intuitive sense since the higher one population proportion is, the lower any other is. Each component of the covariance is negative since each c is always dominated by the (n/N)*(n/N) term. I am not quite sure why Cov(Xi,Xi) ≠ Var(Xi). There is an additional V*(ni/N) positive term in the variance formula that makes both components of it positive. I confirmed these formulas with simulations. Also with simulations, I confirmed that the distributions of the Xs look pretty normal. So now the problem boils down to trying to find: since that is that probability of candidate 1 winning and then to calculate that for each of the k candidates. The approach to this problem for a series of Gaussian seems to be to approximate this distribution above with it's first two moments and forming a new Gaussian. This is not a perfect approximation because the max of two Gaussians is not normal - it is right skewed. Without taking this approximation however, it would be a struggle to find the max of more than two Gaussians. I found this paper about the process of making this calculation. It suggests keeping track of the error in each approximation by looking at the total area between the true pdf of the two normals and the first-two-moments approximation. It suggests that the order that the successive max's are taken makes a difference in the eventual accuracy of the approximation. If which happens candidate 2 has a significantly higher proportion of the votes than candidate 3, then . The correlation between the new max variable and is dominated by the stronger relationship between and . If, however, which happens when candidate 2 and candidate 3 have similar amounts of votes then is significantly greater in magnitude (more negative). I did not attempt to quantify this because I didn't really know what I was doing! I just attempted to tackle the case of k=2 and k=3 and see how the results would compare with the original simulation. For the covariances between the Xs and the max's, I just used the minimum of the covariance between the two pair of Xs separately (this aligned with what I saw in simulations except for the case where which I just ignored since I did not know how to quantify it). The two (really one) approaches I have taken so far are both frequentist approaches. There is another way of approaching the problem that many people would choose - the Bayesian Approach. This requires setting a prior distribution for the population proportions of the candidates. If one were really doing this seriously, experimenting with different prior distributions would be crucial to fine tuning the calculation. Polling would be an obvious way to choose a prior distribution. I'll make two computations, one with a naive prior - alpha = 1, beta = 1 - and one determined based on 538's poll's only forecast of the caucus and see if the results are much different. Now, I'm not interested in 538's pre-results forecast of the chance that Hillary wins, but instead I'm interested in their forecast for the percent of votes she receives (a little lower on the page). Because I am just dealing with a simplified world of 2 candidates, I will split Martin O'malley's projected proportion evenly between the candidates and I see that the projected population proportion for Hillary is around .515. 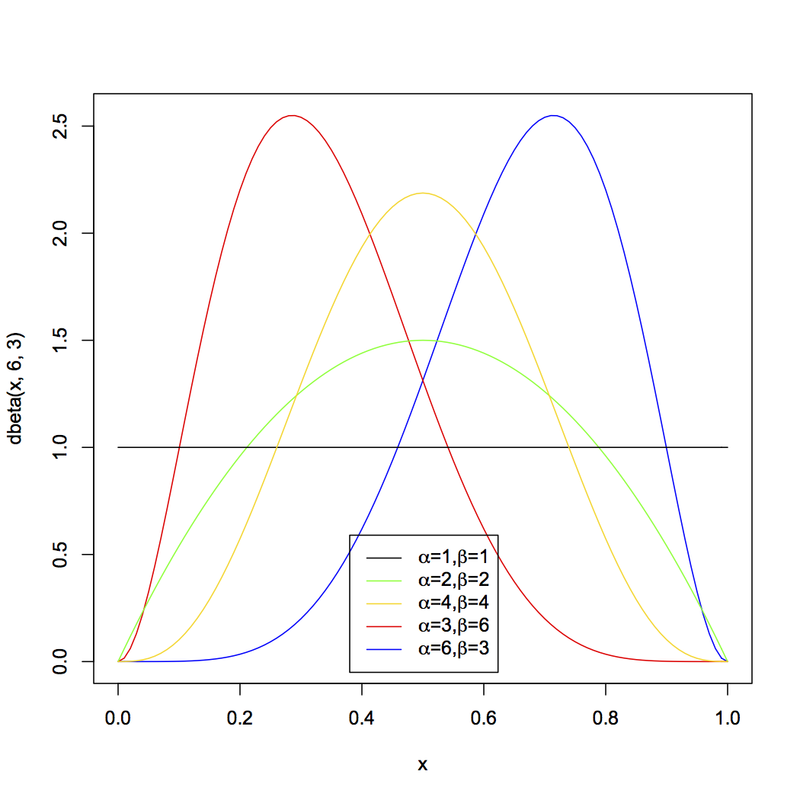 This does not uniquely determine parameters for the beta distribution. As long as alpha = 1.062*beta, the mean of the beta distribution will be .515. I will eyeball 538's projection and multiply or divide both alpha and beta by a constant to try and find a good pair of parameters..
At first, . Then after n votes for the candidate and N-n votes for the other candidate, . In order to win after received n out of N votes seen so far, the candidate must receive at least more votes. where B is the Beta Function. Here is the same sample calculation as I did earlier except I gave Martin O'malley's votes to Clinton and Sanders in the same proportions that they were receiving the other votes with. Probability of each candidate winning: Clinton - .9999996, Sanders - 4e-07. If you are an astute observer, you might be questioning how the above calculation is even possible to do. It turns out that Sympy can handle arbitrarily large numbers and is capable of doing the calculation fairly quickly. To give you an idea of how big the numbers that are produced by the equation above for the numbers in the example, with V = 16666 and k = 8333, , the number of different ways the candidate can receive k out of V votes, is around . Somehow, Sympy handles the whole thing and is seemingly accurate. The prior distribution turns out to be pretty much completely negligible. There are just so many votes that it makes very little difference for any prior which is not very extreme. Now I'd like to do the same calculation for more than two candidates.. Instead of the Beta distribution, I'll use the Dirichlet distribution as the prior and the the Dirichlet-Multinomial distribution for calculating the posterior prediction. If you loop through all the possible distributions of the V remaining votes and keep track of all the times each candidate wins and sum the probabilities of each possible distribution (splitting the probabilities in the instances of ties), then you calculate the probability of each candidate winning. I did this, but there's an issue that comes up. The number of different ways to divide the V votes among the k candidates is . That's a massive number. For the case of k=3, when V = 500, this number is 125,751. The number of ways the vote can be distributed explodes. So, my program will run for only 3 candidates and running it for more than say 350 votes takes way too much time. Nonetheless, it was a good experience writing the program. Playing around with numbers of votes that are more reasonable and making different prior parameters was a good experience in getting to know the Dirichlet-Multinomial distribution. I could not stop here and continue by simulating from the Dirichlet-Multinomial distribution, but I'll stop here instead. Comparing the results to the simulation and my second method, the results of the Bayesian methods are very similar. I posted the programs I wrote here. EDIT: I am back to do the simulating from Dirichlet-Multinomial solution. This is the best one in my opinion because it can easily handle very large number of votes to go and even large numbers of candidates. I use numpy to generate the random numbers which conveniently has both random.dirichelt() and random.multinomial(). With about 10,000 * 10,000 iterations, the estimates of percentage of times each candidate will win is pretty stable and runs within 20 seconds on my computer.